Last weekend, German chancellor Angela Merkel used her video podcast "Merkel für bessere Start-up-Bedingungen" ("Merkel Advocates Better Conditions for Start-ups") to deal with the question whether she would advise people to found a start-up. As Merkel said, she would advise all people who want to do so to pursue their plans. She also said it was very important to improve how Germans deal with failure because everybody deserved a second or third chance. 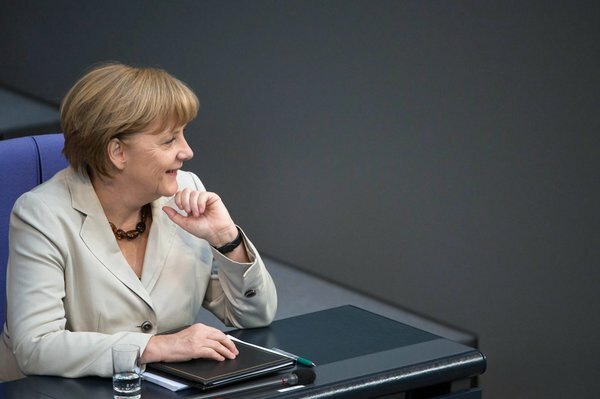 Frank Pelzer, co-founder of the life science start-up JPK Instruments, asked chancellor Merkel how young people could be motivated to found a company, which is often a very lengthy, bureaucratic, and risky process, and how their ideas could be turned into successful products and services. Merkel explained that she thought fiscal conditions for established businesses were OK, but those for start-ups could still be improved. Consequently, she believes that the experience companies in Germany – also many small and medium-sized ones – are making is good. There are some areas, for instance in the digital sector, where small and successful businesses are acquired very quickly by international corporations. In these areas, Merkel continued, Germany or Europe have to ponder how they can become a greater power on the market so that companies can grow without moving somewhere else if they are successful. In addition to funding for research, Merkel supports better funding for start-ups because she said that tax incentives for research were not very targeted. In other words, she believes the next step should be to improve the funding of start-ups. We are glad that chancellor Merkel has recognized this fact. Together with you, our 17,000 Companists, we have been working on improving the financial conditions of start-ups in Germany for two years. Merkel also commented on failure and the stigma it still carries in Germany. She believes that the most important aspect of founding one's own company is still the question whether people want to and are able to live with the associated risk and whether they have a truly viable idea. Thus, she thinks it is really important not to stigmatize failure in the way this is often done in Germany. Instead, a second or third chance should become natural. Finally, Merkel said that if one looks at the philosophies of company founders in the U.S., there are many people who have tried implementing many different ideas and who have also started some less successful projects every now and then.